SENDAI - Le’Bryan Nash wanted the ball and craved the opportunity to showcase his impressive talents on a big stage. 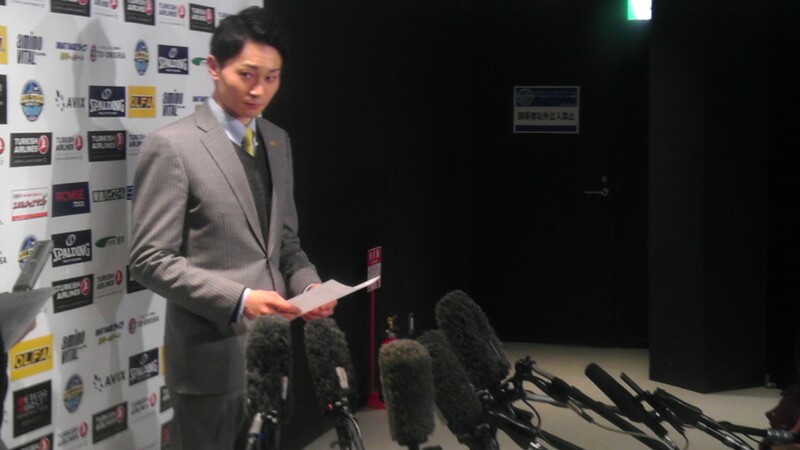 The Fukushima Firebonds rookie forward admitted he wanted a shiny trophy, too. Nash helped lead the East to a 115-108 victory over the West in Sunday’s 10th and final bj-league All-Star Game at Xebio Arena. The Oklahoma State product scored a team-best 25 points on 10-for-20 shooting, including 2-for-4 from 3-point range, pulled down nine rebounds in 20-plus minutes. He was named the game MVP. Before a festive crowd of 4,041, Nash delivered a performance that reminded him of his play in the Kentucky Derby Basketball Classic in April 2011, when he competed with and against many of the elite U.S. high school players. “It was a scoring output for me because I put up some good numbers in high school,” he said, looking back on his schoolboy exploits at the Classic. “And (today) coming out here and put up some great numbers and showed why everybody talks about me scoring the ball. Sendai 89ers head coach Shuto Kawachi guided the Eastern Conference squad to victory, defeating former 89ers bench boss Honoo Hamaguchi, who has led the Kyoto Hannaryz since the start of the 2011-12 campaign, who ran the show for the Western Conference club. Firebonds coach Hiroki Fujita served as Kawachi’s assistant. Fujita also inspired Nash to make his mark in the bj-league’s final All-Star Game before the circuit joins up with the NBL and NBDL to begin play in the new 45-team, three-division B. League next fall. “That’s what my coach was talking about,” said Nash, who leads the league in scoring (25.8 points). Specifically, he added that his coach told him to “just put your name somewhere just to be mentioned. If somebody asks who won the MVP of the All-Star Game, then you can say your name. So that was a great thing, especially on the final time of the All-Star Game in the bj-league. On the West bench, Osaka Evessa coach Dai Oketani worked as Hamaguchi’s assistant. The two men served on former Arizona State mentor Rob Evans’ staff at different times before the bj-league’s inception in 2005. 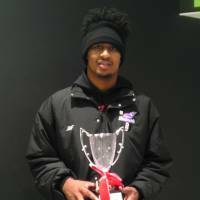 Richard Roby of the Akita Northern Happinets poured in 22 points for the East, including 10 in the decisive fourth quarter, when the winning squad outscored the West 31-18. Roby, longtime NBA big man Kenyon Martin’s younger brother, was 4-for-4 from the field and sank his lone free throw in the final period. 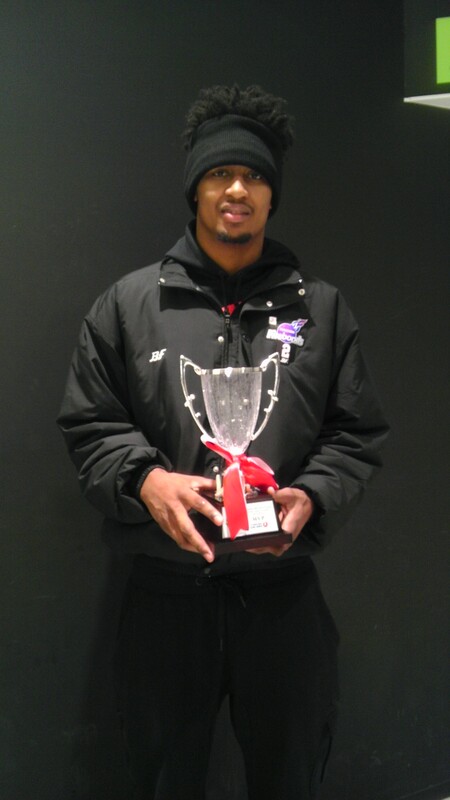 Shimane Susanoo Magic forward Scootie Randall had game-high totals of 26 points on and five assists. He also grabbed 13 rebounds and handed out five assists. He received the Most Impressive Player accolades, which is issued to a top performer on the losing team. Randall, who attended Temple University, expressed disappointment when speaking to reporters after the game. Sendai’s two All-Stars, Wendell White and Takehiko Shimura, finished with 19 and two points, respectively. Shimura dished out four assists, tops on the team. “Everyone enjoyed the game until the end,” a smiling Shimura told reporters, referring to those on the court and in the stands. White led the East with 12 rebounds and collected two steals. As the team captain, he also set the tone for the winners. The West took its biggest lead of the game, 86-72, when Bambitious Nara guard Tatsuya Suzuki converted a layup late in the third quarter. It could’ve turned into a West rout. Instead, Nash took over, igniting the East. He sparked the comeback with a powerful jam, driving down the lane and earning a trip to the free-throw line with 2:29 left in the quarter. He sank the bonus shot to make it a short-lived 11-point deficit. Seconds later, Nash, a right-handed shooter, made a nifty left-handed layup. He added a left-handed jam and a pull-up 3-pointer to close out the quarter. The East used a 12-4 spurt to cut the lead to 90-84 entering the fourth quarter. Nash, who had 10 third-quarter points, recognized he needed to step up at that critical stage of the game. “We were down by 14 and coach put me in,” Nash said, “and I’m just a competitive guy. I don’t care if it’s the All-Star Game or just a regular game . . . and I didn’t want my team to go out like that. So I just tried to go out there and make an impact and let my name be known and the team to feed off me, and that’s what I wanted. You get the MVP trophy if you do that. Twenty-four seconds into the fourth quarter, West guard Yu Okada of the Shiga Lakestars was fouled attempting a 3-point shot and sent to the free-throw line for three shots. He made them all. After a missed scoring chance at the other end of the court, Okada drove baseline and delivered a reverse layup, extending the West’s advantage to 11 points. Eight-time All-Star guard Masashi Joho of the Toyama Grouses, who finished with seven points, answered with a bucket for the East. Hamamatsu Higashimikawa Phoenix forward Reggie Warren capitalized on a takeaway with a big dunk to make it 97-86. Roby knocked down a 3-pointer and Niigata Albirex BB shooting guard Kimitake Sato buried a jumper before Roby’s baseline jam sliced the deficit to 97-93. Wrapping up the East’s 9-0 run, Joho canned an off-balanced jumper to make it a one-possession game. Randall halted the run with an old-fashioned three-point play, working the ball inside to earn a trip to the charity stripe. That made it 100-95 with 6:06 to play. The teams traded baskets over the next few minutes, and the West pulled ahead 105-102 on Randall’s basket-and-one with 3:09 remaining. And then it was Nash’s turn to operate. He drew a foul while attacking the basket. He calmly sank two free throws, getting the second shot to bounce off the rim and through the cylinder. After a West possession that ended with a missed 3-pointer, Nash put the East back in front, 106-105, on a reverse layup. Okada made a 3 from the left wing, and that 108-106 advantage with about 2:05 left on the game clock was the West’s final lead. And it was his team’s final basket of the day. The West had a lousy fourth quarter on offense, shooting 5-for-25 overall and 1-for-12 from 3-point range. “We missed a lot of open shots,” Randall told reporters. Gutsy East guard Shigehiro Taguchi, a popular Akita Northern Happinets standout, knotted the score at 108-108 on a shot in the lane. White then sealed the win at the free-throw line, making 5 of 6 shots the rest of the way. He put his team ahead for good with 1:14 left on a pair of foul shots, and Taguchi nailed a jumper for good measure. After Taguchi’s make, the West, which trailed by four, called a timeout with 45.3 seconds left. Hamaguchi’s squad took three more shots and missed all of them. The last three points came courtesy of White’s visits to the line, and Suzuki missed a 3-pointer on the final shot of the game. With the victory, the East tied the all-time All-Star series at 5-5 between the rival conferences. The West finished with 19 turnovers, nine more than its foe. In the end, those additional opportunities paid off for the East, which made four more field goals than its opponent. Both clubs attempted 61 shots from inside the arc, with the East making 36 to the West’s 33. The teams had similar 3-point totals, too (East: 10-for-37; West: 9-for-32). Speaking in front of the assembled media, Nash revealed he was pleased with his performance. The Firebonds (16-10) sit in fourth place in the 12-team East. They’ll look to rise in the standings as the second half of the season gets underway on Saturday. While Nash and Roby and White combined for 66 points, the East had three other double-digit scorers: Taguchi (11 points) and Thomas Kennedy (Gunma Crane Thunders) and Alandise Harris (Iwate Big Bulls) with 10 apiece. For the West, Okada poured in 17 points, Warren contributed 11 points and a game-high 16 rebounds, Jarvis Williams (Takamatsu Five Arrows) had 11 points and Gyno Pomare (expansion Kanazawa Samuraiz) scored 10. Suzuki had four assists. The West led 36-30 after one quarter and 66-60 at halftime. But the start of the game provided an omen of the second half’s key stretch. After an alley-oop from Shimura to Nash didn’t produce the desired dunk — the crowd reacted with a collective aah — the MVP sank a 3-pointer a few possessions later and a White layup gave Kawachi’s club a 5-0 advantage to work with. That set the stage for an entertaining back-and-forth duel for much of the game. 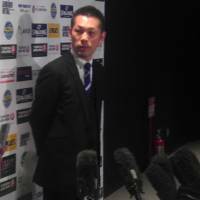 “We had a slow start,” Hamaguchi conceded. 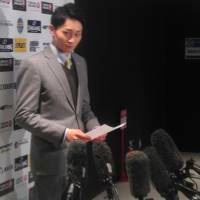 For the East, third-quarter adjustments were key, Kawachi said. He added that he spoke with Fujita and they teamed up to design plays that worked. “I enjoyed the game. It was a wonderful matchup,” Kawachi said. 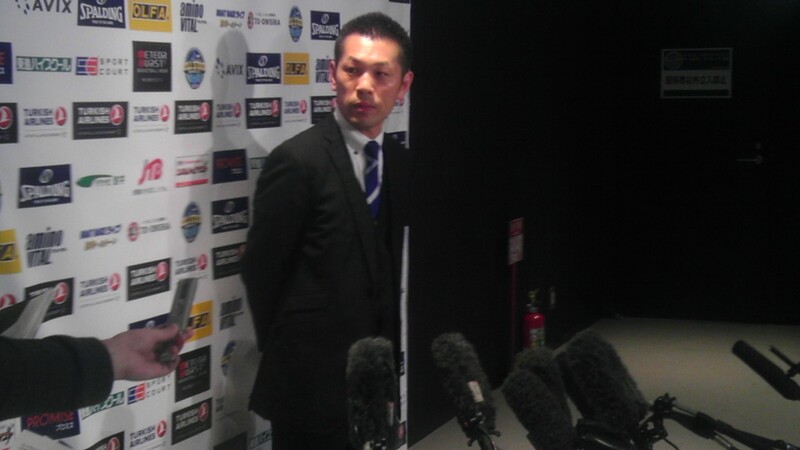 Taguchi said confidence paid off for the veteran-dominated East squad in the fourth quarter. In the paint: Former 89ers backcourt mates and Sendai natives Shimura and Hikaru Kusaka, the latter who now plays for the Kyoto Hannaryz, squared off for the opening tipoff. Shimura won the tip. . . . Sunday’s contest was the second All-Star Game to be held in Miyagi Prefecture. In 2010, All-Star weekend festivities, hosted by the Sendai 89ers, were held in Rifu. . . . Tokyo Cinq Reves big man John Florveus won the Slam Dunk Contest, beating a field that included Ray Turner (Akita), Nash, Josh Davis (Shimane), Atsuya Ota (Hamamatsu) and Williams. “I was just trying to impress the crowd,” Florveus said. “I came out and had fun.” Florveus outpointed Japan national team big man Ota 42-40 in the final round. . . . In the 3-Point Shootout, Taguchi outlasted Patrick Sanders (Iwate Big Bulls), Fumiya Sato (Sendai), Daichi Shimoyama (Aomori Wat’s), Okada and Andre Murray (Hiroshima Lightning) to nab the title. Sanders, a University of California-Irvine alum, recorded a remarkable 29 points, one shy of a perfect score, in the opening round. In the one-minute format, each contestant took 25 shots, with five shots apiece from five assigned spots on the perimeter. A made basket counted as one point, with the final “bonus” shot from each station counting as two points. The six-man competition was trimmed to Taguchi and Sanders in the final round, with Taguchi amassing 25 points and Sanders scoring 19. Zero fouls were called in the first quarter. . .
White expressed the view that teammate Jamal Boykin “should’ve been an All-Star, too.” The veteran post player’s numbers support that opinion. Boykin is averaging 20.3 points and 12.0 rebounds a game. Looking ahead to the second half of the season, White said the East-leading 89ers (21-7) need to “be consistent and stay hungry,” adding that he tells his teammates “not to be worried” about its won-loss record. . . . Shimura has lofty goals to close out the season, saying he wants the 89ers to go to Ariake Colosseum for the Final Four and become champions.